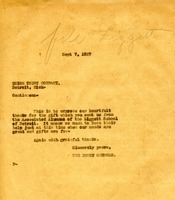 A letter from Martha Berry detailing her friendship to Miss Ella Liggett and encouraging any Liggett School graduates to come to Berry. 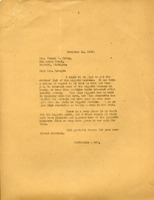 This is a copy of a letter Martha Berry send to a large number of Liggett School graduates. 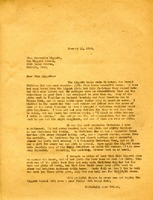 In this letter Mrs. McGrew gives Martha Berry the name of and adress of the secretary of the Alumni Association for the list of Ligget graduates because Mrs. McGrew will be leaving the country soon. 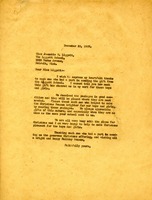 Eleanor WcGrew writes to inform Martha Berry of an enclosed check. She says that one of Berry's visits to the Liggett School made a strong impression on her, and she wishes to contribute to the cause. 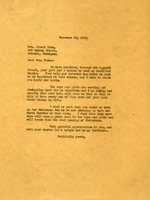 Martha Berry writes to Mrs. Kahn thanking her for her gift which she received through the Liggett School. She talks about how hard the students are working and says that she wishes Mrs. Kahn could be with them for the Christmas Eve Carol Service which teaches the real meaning of Christmas. 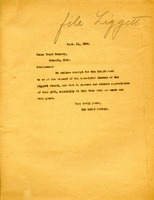 Martha writes to MIss Liggett to thank her and everyone who sent the gift from the LIggett School. In this letter Jeanette Liggett asks Martha Berry to keep the names of the donors anonymous because it was supposed to come from the general donation fund. 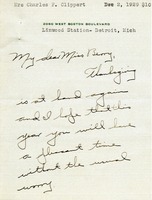 Letter from the Berry Schools expressing gratitude to the donation from the Associated Alumnae of the Liggett School of Detroit. Liggett suggests that Berry send information about what was done with the contents of Christmas packages sent from the Liggett School to the Berry Schools.